Before and after photos show impacts on Trent Road from the New Bern Marketplace shopping center construction. The photo on the left was taken several years ago. The photo on the right was taken on Wednesday. City officials are revising design standards for the Trent Road Corridor “to accurately reflect the development pattern” that has emerged on that stretch of city street. Changes were approved by the Planning and Zoning Board at its meeting on Tuesday and will come before the Board of Aldermen for final approval. Removing a requirement that buildings maintain a front yard setback of 35-50 feet from the street right-of-way. Removing a requirement that at least 60 percent of the front yard area of any development will consist of vegetation. Removing a requirement that parking be on the side or behind buildings rather than between Trent Road and the main building. The affected corridor stretches from Ninth Street to Dr. Martin Luther King Jr. Boulevard. Trent Road was once the main road serving New Bern, Jones County and Jacksonville, but a new road, once called Clarendon Boulevard but now called Dr. Martin Luther King Jr. Boulevard, shifted development away from Trent Road. Trent Road became a commercial backwater over the years, but more recently, with the development of New Bern Marketplace and other smaller commercial and office facilities, Trent Road is becoming a popular location for developers. Of course, the largest by far is New Bern Marketplace, a 34-acre, 325,000-square-foot shopping center located between Dr. M.L. King Jr. Boulevard, Trent Road and South Glenburnie Road. New Bern Marketplace will be anchored by Harris Teeter’s first 100,000-square-foot grocery store, which will include a gas station and a pharmacy with a drive-though. Other retailers opening there include Academy Sports, Ross, ULTA, Five Below, Lee Nails Spa, Hobby Lobby, and Rack Room. Michael Stephens, a Riverside Neighborhood resident, plans to open an outdoor recreation facility on Beech Street off Oaks Road following approval by the city to rezone the property from residential and light industrial to commercial. Stephens has combined two lots, 107 and 109 Beech St., which have access to Jack Smith Creek near its mouth with the Neuse River. The resulting 1.14 acres would be used for a venture he is calling Oaks Watersport Landing: The Owl. He said most activities will be done during daylight hours. Initial hours of operation would be 9 a.m. to 9 p.m., five to seven days per week, weather permitting. It may close one to two months out of the year due to seasonally declining activities. He estimates the venue will have about 10-15 guests per day with a total capacity of 120 people. A building described as a “lodge” is part of the plan. The late Steve Jobs is often touted as one of the great innovators of the age, but his real genius was in taking ideas from others, tweaking them, and selling them. Jobs didn’t invent the computer mouse, smart phone or the MP3 player, for example; others came up with those ideas, but his tweaks changed everything. Taking cues from Steve Jobs, the City of New Bern has gone into he business of taking others ideas, as well. For example, take the Farmer’s Market. For $1 per year, the Farmers Market was leasing city-owned land at South Front and Hancock streets coveted by developers. Everyone was happy, the Farmers Market thrived, and neighboring businesses enjoyed the extra foot traffic Farmer’s Market attracted. Meanwhile, the city was saddled with a blighted piece of property off First Street zoned for heavy commercial use that it will never be able to sell because of decades of accumulated pollutants from the power plant that once stood there. On a tear to unload surplus property, here was one property the city could not unload, so it sought alternatives. City officials thought they could kill two birds with one stone. They approached Farmers Market leaders about moving to the First Street power plant property, a concept called City Market. Moving Farmer’s Market would free up city-owned land it could sell, and put to use city-owned property the city could not sell. Farmers Market board members didn’t like the idea. They are doing well where they are and the rent they paid to the city for the property was almost nothing. Also, the present location brings in casual visitors who are downtown for other reasons. Downtown businesses didn’t like the idea, either. They see Farmers Market as an additional attraction that fills restaurants and shops with customers on mornings when the Farmers Market is open. At the moment, almost nobody goes to the old power plant, and other than Lawson Creek Park across the road, there is nothing else for people to do in that section of town. It started to get ugly, as things often do when one opposes City Hall. There were veiled threats of eviction countered by a petition that gathered 15,400 signatures from people opposed to the Farmer’s Market moving. At some point city officials realized that the Farmer’s Market had an ace up its sleeve: Although its lease with the city was about to expire, it had the option to extend it for one more year. That would have put the city in the awkward position of evicting a beloved downtown institution right in time for the 2017 municipal elections. The city backed off. Rather than let a squabble with Farmers Market and downtown merchants drive the 2017 municipal elections, the city was forced into another lease. This time, however, it increased the rent from $1 a year to $500 per month. The idea seemed to wither away. There was no further public discussion about outdoor vendor sales at the old power plant property. But meanwhile, city officials worked out a deal for Craven Community College to use the First Street main building for vocational classes, calling it the Volt Center (a nod to the building’s past as an electric plant). 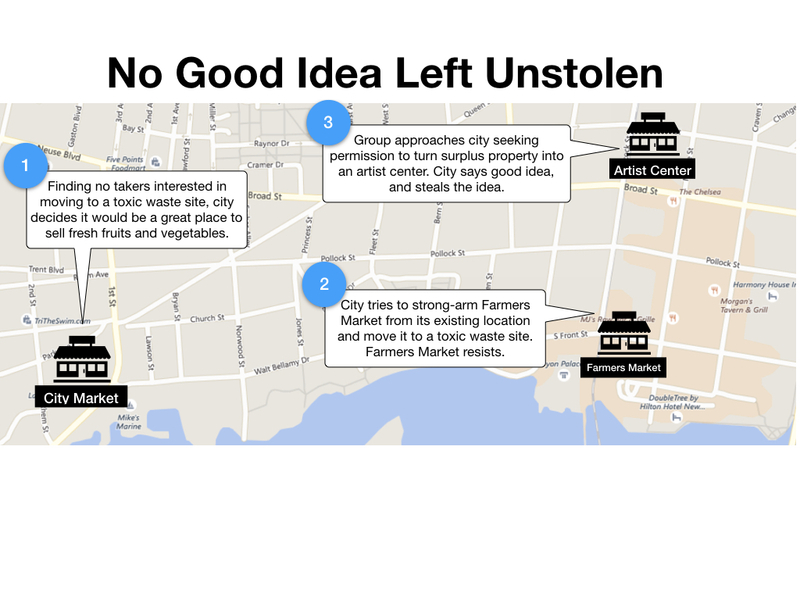 Then on Feb. 13, the City Market plan sprang forth once more. The city is now seeking grant funding to help pay for outdoor vending areas, a market, a commercial kitchen accelerator, and an inventor’s space. As city director of Development Services Jeff Ruggieri said, the idea never went away. But now, rather than forcing the Farmer’s Market to move, the city now looks poised to go in head-to-head competition with the Farmer’s Market. It’s an odd thing, the city trying to compete with an existing commercial operation. Alderman Jeffrey Odham has said he wanted to run the city more like a business, but this? Start a business? One that competes with existing businesses? And it’s not the only one. In January, a private artists group approached the city seeking approval to rent the old Firemen’s Museum on Hancock Street. A little background on that: after he became mayor, Dana Outlaw began a push to unload as much surplus city property as possible. The Hancock Street museum property was on the list, and the city gave the bum’s rush to the Firemen’s Museum, forcing it to rush fundraising efforts to pay for renovations of the old Broad Street Fire House so the museum could move there. Outlaw and city staff envisioned selling the old museum site on Hancock Street, but when bids came in, they didn’t meet minimum requirements. The building is a fairly large commercial space suitable for a restaurant or even a microbrewery, but there’s a problem: it has no parking. True, there’s a city-owned parking lot right next to it, but the downtown parking plan calls for the city to reduce the number of leased spaces, not increase the number. And the city parking lot at New and Hancock streets is a pretty important component to the city’s master parking plan. So, like the old power plant on First Street, the city found itself with a substantial piece of real estate that is virtually unsellable. It makes one wonder whether city officials do any research into these things before jumping in. Back to the artists’ group. It had lost its existing location and was basically homeless and in a bind. They thought that perhaps they could rent the Hancock Street property from the city for, say, $500 a month — the same thing Farmer’s Market was paying for its piece of prime real estate. Good idea, Mayor Outlaw said. More research is needed. Could be the city would pay them, rather than the other way around. But that’s not how it turned out. Meetings were held and the city came back with a plan: The city Parks and Recreation Department would open up its own art gallery and artist space at the old Firemen’s Museum — and make money doing it. That private artists group? Still homeless, although they are welcome to apply to use the city-owned, city-run artists gallery along with everyone else. So, yeah, those are two examples of the city shouldering its way into areas previously the domain of private groups. A little bit sneaky, a little big underhanded. But unlike Steve Jobs, who bought or stole proven, successful ideas and made them better, the city still has to prove whether it is any good at running an outdoor market and an artists gallery, both of which have existing and entrenched competition in the city. But, paraphrasing a line from Steve Jobs when he would announce new products, in the sneaky, underhanded department, that’s not all. Winnie Smith and Lindsay Sims, daughters of the late Greg Smith, have taken over the running of Mitchell Hardware. Greg Smith died suddenly on the morning of Jan. 29 while working at his store. A story by the ever-excellent Bill Hand at the Sun Journal here. Shoe Carnival, a discount shoe store at Rivertowne Square (you know, the one with Books A Million on one end and Wal-Mart Supercenter on the other), is closing. A source with the company said the New Bern store was under-performing, and faced with the prospect of competition from Rack Room and Academy Sports at the New Bern Marketplace shopping center, the company threw in the towel on its New Bern location. Shoe Carnival fans can still find stores in Greenville and Jacksonville. Rivertowne Square is in the process of facade renovation work on its east end. 3rd Rock Brewing’s plans for a tap room off Pollock Street have been put on hold while the owner looks for a different, perhaps larger location. Negotiations continue. 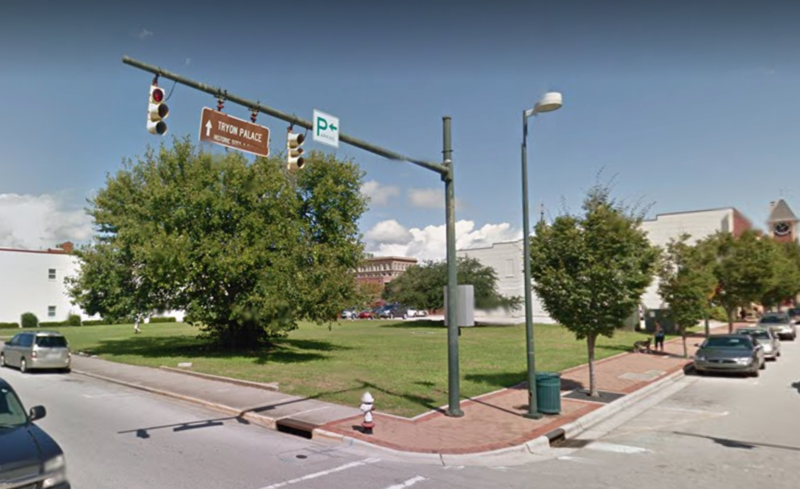 Policy wonks from the UNC School of Government are urging the City of New Bern to turn its attention from a possible parking structure and hotel across from City Hall, and return its attention to a vacant lot at the corner of Craven and South Front streets. UNC SoG special projects managers Marcia Perritt and Omar Kashef appeared before the Board of Aldermen on Tuesday to advise on behalf of the pivot. The Pollock and Craven parking structure/hotel SoG had been advocating has been put on hold while Craven County officials decide whether they want to participate. Participation for the county is no small matter. It includes moving the county tax office, donating the property on which the tax office resides to the project, and pooling its tax revenues from the ensuing project until the city pays off the seven-figure costs to build the parking deck. The vacant lot at the corner of Craven and South Front streets was acquired by the city as two separate purchases totaling $209,000 in 2000 and 2001. Tax value of the property is now listed at $567,630. In the mid-2000s, Talbots looked at the property to build a department store, but opposition to the plan put a stop to that. Since then, the lot has been home to grass and one stately tree, with occasional events being held there. SoG envisions a hotel being built on the property, assuming that some agreement could be made with the city to lease nearby public parking spaces for hotel guests. SoG apparently is unaware that nearby municipal parking lots are part of a proposed parking master plan tied in with enforced two-hour parking streetside and a push to get visitors and downtown workers to use the municipal parking lots. Kashef said the goal of SoG’s efforts is to keep people downtown after 5 p.m. by finding projects that serve the public interest and that are financially feasible. Bengel also urged SoG to make sure there is public participation in the process. Alderman Johnnie Ray Kinsey reminded that the Five Points area continues to lack any attention from the city in terms of economic development. “It would be good to see the city grow together,” he said. Faced with a 20-day suspension of his ABC licenses, James Monette, owner of Monette’s Grocery on Old Cherry Point Road, has agreed to pay a $2,000 penalty to keep that suspension from happening. Monette, brother of Craven County Sheriff Jerry Monette, knowingly possessed gambling equipment at his convenience store around Aug. 31, 2017, according to state ABC officials. The gambling equipment was described in comments by a member of the Monette family as a “quarter pusher” that has been in the store for a long time. Monette’s Grocery, at 4001 Old Cherry Point Road at the corner of East Thurman Road, holds licenses issued in 2003 to sell malt beverages on site, and fortified and unfortified wine off site. 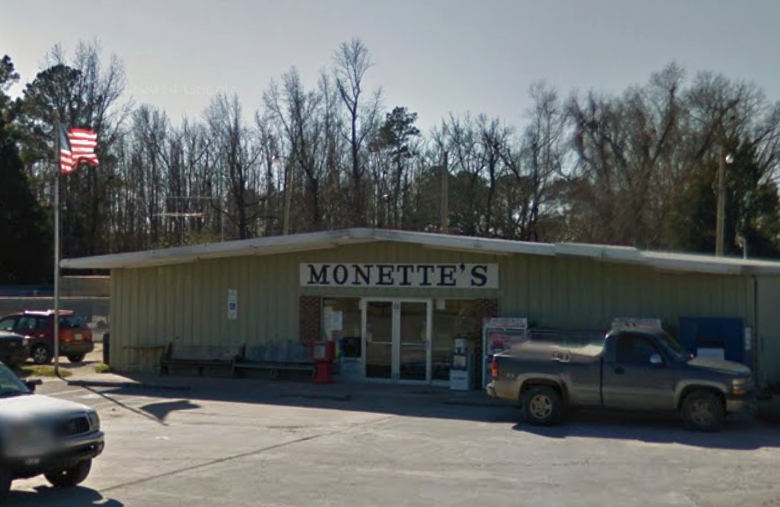 Monette has operated a convenience store at that location since it was built in 1972, according to Craven County tax records. The state ABC Commission accepted Monette’s offer to pay the penalty in lieu of the suspension during its meeting on Tuesday. The suspension would have started March 16 and lasted 20 days. ABC license holders who face suspensions commonly pay fines for any transgressions, since the fines are often less expensive than the lost revenue from suspended beer and wine licenses. Editor’s note: Stephanie K. McIntyre, who gave an invalid email address, emailed this feedback: The story about Monette Grocery is in accurate. First of all the brother that owns that store is not the Sheriff’s twin brother Gary. I’m willing to bet you got your information from either Matt Knight or Chip Hughes. Monette’s Grocery have not paid the fine, they have received a letter. So, yes this is fake news. Because so far the primary facts are inaccurate. 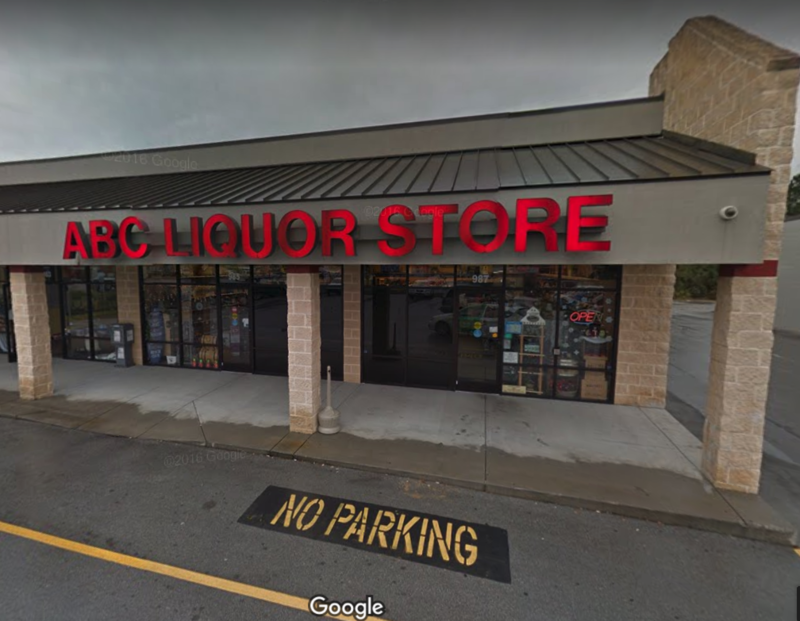 The ABC store in James City is slated for closure just before its lease expires in June 2019, and a new store will be built in Bridgeton to open in May 2019. The plan received approval from the state ABC Commission on Tuesday. Google Maps satellite view of the planned ABC store in Bridgeton. The Craven County ABC Board requested approval from the state ABC Commission to relocate its James City store to a new location in Bridgeton just off U.S. 17 at C and Pine streets. In his report to the state commission, Craven ABC General Manager Paul Brown said the James City store’s lease expires in June 2019 and will close upon opening of the new store in Bridgeton. Brown said the James City store would be affected by future construction on U.S. 70. Brown said the Bridgeton store would be on a busy highway and tap into an additional market (east of the Neuse River) in that area. Brown estimates sales at the Bridgeton store to be $2.4 million the first year of operation, compared to $2.1 million at the James City store last year. That construction would turn that stretch of U.S. 70 from a surface street into a controlled access expressway, or freeway. Craven County has five ABC stores. The Bridgeton store would be built from scratch. Craven ABC entered into a purchase agreement for the 0.6-acre lot for a price of $269,900. The closest ABC store to the Bridgeton store would be on South Front Street in downtown New Bern. Another ABC store is located near Harris Teeter on South Glenburnie Road. Floorplan of the planned ABC store in Bridgeton. The Bridgeton store would be 4,800 square feet for retail space and 1,000 square feet for office and warehouse. Cost of construction is estimated at $1.25 million, funded through a bank loan with First Citizens Bank. Like everyone else who knew Greg Smith, his death Monday morning filled me with a terrible sorrow. Like everyone else who knew Greg, I felt as though I lost my best friend. Greg was a joyous soul, one of the kindest people I ever met. As I write this, my mind sees his infectious smile, hears his gravelly voice, rejoices in his gentle nature, and is amazed by his super human enthusiasm. Shortly after launching New Bern Post back in October, I began work on what was to be a series of feature articles about things that make New Bern special. Greg Smith and Mitchell Hardware, one and the same, were first on my list. I started laying the groundwork. I visited Mitchell Hardware more often, surreptitiously gathering information for the article I was going to write while buying things I didn’t really need. Did you know Mitchell Hardware stocks more than 80,000 items? That’s what a store employee told me, confirmed by Greg himself. I have half a notebook full of little tidbits like that. I was going to surprise him with it. I would take my collection of tidbits, photos and videos about him and his store and put it on my website, then I would show him. He would be flattered and a little embarrassed. He did not deserve such attention, he would have said. That I did not finish it is tragic. That Greg is no longer with us is our tragedy. But Greg’s death, though untimely and unwanted, was not tragic. It is lives that end unfulfilled that are tragic. Greg’s life is the embodiment of a life lived well and a life fulfilled. Greg’s life was a storybook of friendships and accomplishments and a wonderful store filled with treasures useful and useless totaling more than 80,000 items. I knew Greg just over eight years. His house is around the corner and down the block from mine and I walk past it nearly every day. Often I saw him in his yard and waved. Sometimes I’d stop and we would have a chat while I petted his dog. It struck me a bit odd that someone who runs a wonderful place like Mitchell Hardware would live so simply … a gray-painted bungalow with a simple yard. Of course I know the reason; we all do. Greg Smith spent his life dedicated to his store and a city full of best friends. A plan that includes enforced two-hour parking in Downtown New Bern cleared a hurdle on Tuesday. Following a public hearing during which a committee’s recommendations went largely unchanged, the board asked its staff to prepare an ordinance and bring it back for a vote at the board’s first meeting in February. A committee met over several months in 2017 to come up with ways to solve a perceived problem with downtown parking, with any decisions on the committee’s recommendations put off until the Board of Aldermen’s first meeting in January to enable new aldermen to weigh in on the issue. Alderman Sabrina Bengel, whose ward includes all of downtown New Bern, led the discussion. While she had some concerns about how much the city ought to charge for leased spaces, she agreed with most of the recommendations. 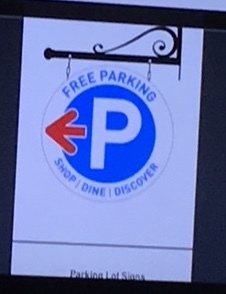 They include enforced two-hour parking; an increase in parking fines from $5 to $25, doubling to $50 if not paid within 30 days; and improved directional signage directing motorists to city lots on Hancock Street, South Front Street and at the Farmers’ Market. Notable what the plans do not include is paid street side parking or a push for a parking structure. Bengel estimated that there are 200 parking spaces downtown that go unused. “We don’t have a parking problem, we have a walking problem,” she said, describing people unwilling to walk an extra block or two to take advantage of areas where there is a surplus of available parking. Alderman Jeffrey Odham expressed concerns about picking and choosing pieces of the committee’s recommendations, which he said were intended to look at the problem of downtown parking holistically. He said his big concern is picking and choosing from the committee recommendations just to get the ball rolling, but creating a bigger parking problem six months down the road.